Need more drive? Lacey’s TJM can give you that with our TJM Pro locker. Unique air operated piston style actuator aims to eliminate the risk of oil being pumped up the airline. 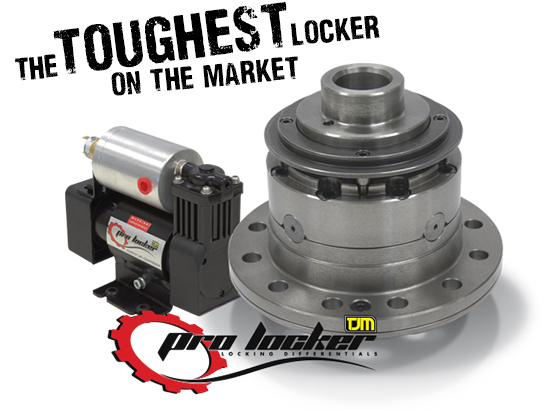 Hardened thrust washers and the size of the locking ring make Pro Locker extremely strong in operation. Stronger materials and a thicker carrier compared to most standard differentials. Larger pinion gears compared to most standard differential. No carrier modification needed other than the drilling and tapping of a bulkhead fitting port. Pre tensioned 10mm bolts hold hemisphere together. Reinforced rubber external hose extension is supplied as standard to minimize the risk of the airline being damaged by debris while driving. Recessed coloured L.E.D cabin switches show clearly when TJM Pro Locker is on or off.